All April 2019 monthly class series run on Tuesdays for 5 weeks: April 2, 9, 16, 23, 30. Registration for the full APRIL monthly class series is now closed. However, you can still drop in for single individual classes of an April class series, as described below. Or register for a 3-week MAY 2019 monthly class series (May 7, 14, 21)! 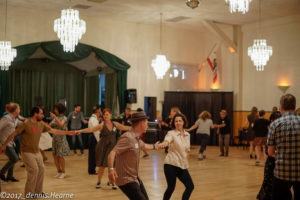 Or just attend our live music Dance Party (with a different band each week) and learn a few easy steps in our 15-minute drop-in Basic Swing dance lesson (included with the $10 Dance Party admission, different steps taught each week, and no partner or registration is necessary)! The original swing dance from late 1920’s Harlem, Lindy Hop evolved from the Charleston and African-American dances along with the jazz music of that era. It is characterized by dynamic movements, the breaking away of partners into open position, and a joyful improvisational nature. Quite possibly the most fun partner dance ever created! Description: The Lindy Hop basics, Side-by-Side Charleston, Swingout, and Lindy Circle, are taught every month, and different variations are taught each month in the later weeks of class. Important concepts like frame, connection, musicality, styling, and etiquette are also introduced. By the end of the month, students will have learned enough to dance on their own! However, many students take this class more than once to review and build confidence with the 8-count basics and fundamentals. Prerequisites: Previous swing dancing experience is helpful, though not required. Complete beginners are welcome in this class! Description: Different steps and concepts are introduced each month, so this class is designed to be taken continuously over several months. Topics include more complex variations, footwork syncopations, fine-tuning of frame and connection, more advanced musicality concepts, jazz steps, and improvisation. 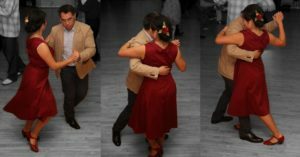 Prerequisites: Students must already be confident with 8-count basics, including the Lindy Hop Swingout and related turns, and basic Charleston steps. They are expected to be social dancing Lindy Hop regularly outside of class. Balboa originated in Southern California in the 1920s and enjoyed huge popularity during the 1930s and 1940s. Because it emphasizes rhythmic weight shifts, subtle movements, and closed-position partnering, Balboa is ideal for very fast tempos (around 180 to 300 beats per minute). Description: There are many core concepts and skills to learn in Balboa. Mastery takes time and practice. In recognition of this, we have crafted 4 months’ worth of classes to introduce new ideas and review challenging ones over time. There is no “first” series, so feel free start any month that is convenient for you. And don’t worry, you won’t be promoted out of the Beginning level until you are comfortable with all the material. Many dancers prefer to stay at this level for 6 or 8 months. Description: Having mastered the core material in the Beginning level series, the Intermediate level classes adds depth and texture, including musicality, refined technique, fancy footwork variations, transitions, classic and fresh baked combinations. We have several years of ever-evolving Bal material, as well as 3 months of Slow Bal material that we work into the rotation. Prerequisites: Students must be able to confidently dance both up- and down-hold basics, scoots, paddles, the breakturn, transition, crossovers, come-around, and send-out. They are expected to be practicing and/or social dancing Balboa regularly outside of class nights. Dropping in and paying for a single class of a monthly class series at the door is allowed for any week ($20/person) and includes admission to that night’s Dance Party. 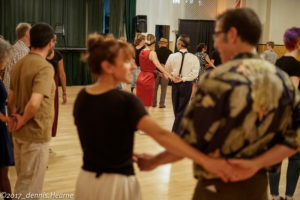 However, because these series classes are progressive, unless you already have sufficient swing dance experience, dropping in for classes later in the monthly series (without having taken that month’s earlier classes) could be difficult. To get the most out of the classes, we recommend that you take the full series. In particular, if you cannot make the first week of class for a certain month, we recommend waiting to register for another month in which you can. And if you must miss a class, you may want to consider taking a private lesson from one of your instructors to catch up. You may attend two monthly classes scheduled for the same month (or week), and pay only half-price for the 2nd class! Just make sure the two classes are scheduled at different times. For example, if you drop in for a single class of one of our 7-8pm monthly classes (for $20), you may also drop in that same night for a single class of one of our 8-9pm monthly classes for only $10 more (that’s two drop-in classes in one night–plus the dance party–for a total of $30)! Or, as another example, let’s say you’ve registered for one of our full 7-8pm monthly class series for the whole month. You may drop in during that same month for a single class of one of our 8-9pm monthly class series for only $10 more! Please feel free to email Hep Jen at hepjen@woodchoppersball.com.